St. Bernard of Montjoux, also known as St. Bernard of Menthon, was the founder of the famed Hospice, which served the travelers for nearly 1,000 years. He was also the founder of the Congregation of the Canons Regular, which has served it throughout that history. It is also the Hospice that gave rise to the famous breed of dogs, St. Bernard, named for that Hospice. Bernard was born around 1020, probably in the Chateau of Menthon, a part of the Kingdom of Arles. He was the descendent of a rich and noble family, and received a good education. When he had received his education, he decided to devote himself to the service of the Church and refused an honorable marriage proposed by his father. A popular story is that he fled from his castle the night before his arranged wedding, and threw himself from an upper window. He was captured by Angels and lowered gently to the ground, 40 feet below. He placed himself under the director of Peter, the Archdeacon of Aosta. It was under Peter’s guidance that he rapidly progressed in his faith, and Bernard was ordained a Priest. Because of his learning and heroic virtue, he was appointed to succeed his mentor as Archdeacon of the Cathedral, duties included being in charge of the government of the Diocese, and he worked directly under the Bishop. Bernard was disturbed by seeing the old pagan ways continue among the people of the Alps, and devoted himself to their conversion. For forty-two years he continued to preach the Gospel to these people and even into many other areas, effecting numerous conversions. He was said to have worked many miracles. It is for another reason, however, that Bernard’s name will forever be famous in history. Since the most ancient times there has been a path across the Pennine Alps. This lead from the Valley of Aosta to the Swiss Canton of Valais. The traditional route of this pass is covered with perpetual snow from seven to eight feet deep, with drifts of snow sometimes accumulating to the height of forty plus feet. This pass was extremely dangerous, especially in the springtime with the threat of avalanches, and French and German pilgrims on their way to Rome often used it. His position in his office as the Archdeacon, Bernard had the duties of caring for the poor and travelers. For their convenience and protection, Bernard founded a Canonry and Hospice at the highest point of the pass, 8,000 feet above sea level, in the year 1050. This site now bears his name. Within a few years, he established another Hospice on the Little St. Bernard Pass, a mountain saddle in the Graian Alps, 7, 076 feet above sea level. Both of these were placed in the care of the communities of the Canons Regular, after Papal approval had been obtained by Bernard during a visit to Rome. The new community was placed under the patronage of St. Nicholas of Myra, patron saint of travelers. St. Bernard died in June 1081 in the Imperial Free City of Novara and was interred in the monastery of St. Lawrence. These Hospices were renowned for the generous hospitality extended to all travelers over the Great and Little St. Bernard Passes, so called in honor of the founder of these charitable institutions. At all seasons of the year, but especially during heavy snow storms, the Canons were accompanied by their well trained dogs, the common herding dogs of Valais, St. Bernards. They would go out in search of victims who might have succumbed to the severity of the weather, or needed assistance. They offered food, clothing, and shelter to the unfortunate travelers and took care of the dead. They depended on gifts and collections for sustainability. As of 2012, the Congregation consisted of about 35 Professed Members, the majority of them live at the Hospice while providing pastoral care to neighboring parishes. St. Bernard dogs are still used on the site as pets, while helicopters are used in rescue operations. St. Bernard was venerated from the 12th century, but was not formally canonized until 1681 by Pope Innocent XI. Pope Pius XI confirmed St. Bernard as the patron saint of the Alps in 1923. St. Bernard of Montjoux, also known as St. Bernard of Menthon, was the founder of the famed Hospice, which served the travelers for nearly 1,000 years. He was also the founder of the Congregation of the Canons Regular, which has served it throughout that history. It is also the Hospice that gave rise to the famous breed of dogs, St. Bernard, named for that Hospice. He was ordained a Priest, and was charged with ministering to the French and German pilgrims, who while traveling to Rome, had to cross the Alps. He built two Hospices to offer food, clothing and a warm shelter over two of the Passes at the peak of the Alps. Both were named in his honor, the St. Bernard Pass, and the Little St. Bernard Pass. 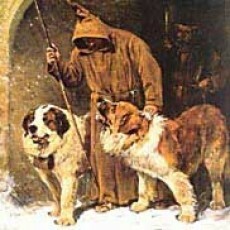 He and his Order used St. Bernard dogs to search and rescue weary travelers, and to bring them back to the Hospices. From the 11th century onward, these dogs are still used today for “rescue” dogs – named in his honor.